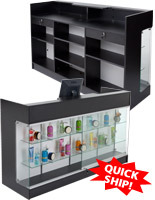 Extra Vision Counter Configuration - 68" x 68"
By offering these pre-configured extra vision retail display cases we are able to reduce our manufacturing costs and pass the savings onto YOU! 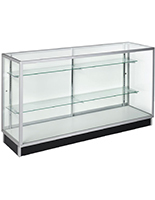 Our best selling series of extra vision retail display cases include two adjustable height, tempered glass shelves, one 10" deep and the other 12" deep. 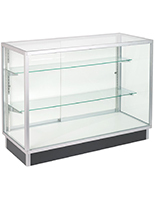 These display cases also feature locking white hardboard sliding doors and brushed aluminum framing . Every piece of glass in these display cases is tempered. This process makes the glass several times stronger than regular glass. 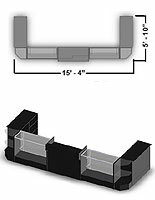 It also makes it safer because if broken it yields small, more manageable pieces. 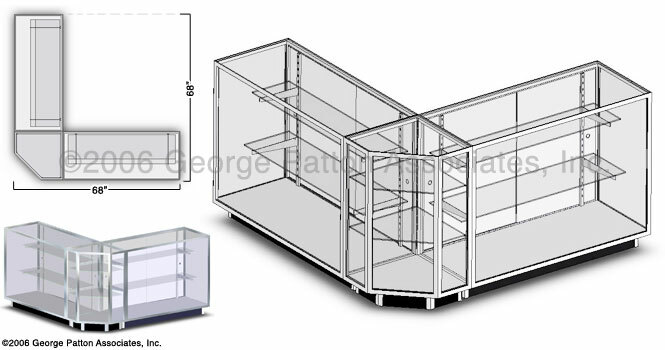 Take a look at what other cases are made with. Standard plate glass (annealed) remains in large pieces when broken and is a danger to you and your customers.